As you can probably imagine, since starting the Spooky Marion site back in 2008, I’ve heard my share of local haunted house stories. Although I’ve known about the following three places for years, I’ve always put off writing about them. It’s not that the stories about each place are actually little more than rumors – I could live with that. (Let’s face it, a lot of this site’s content is devoted to rumors.) Rather, it’s just that each story is pretty meager. For that reason, I’ve decided to put all three together in one article. Marie told about the old Lapham brick [house]. Rev. Crabtree lived there on road 27, [and] some said it was haunted. [There] was a spot on the floor that could not be washed away. There were whistling sounds heard [and], as the story goes, that a packpeddler went in, but never came out. Obviously, the story interested me, and I was eventually able to track down a descendant of the Lapham family, a guy named Mike Brewer. He told me that Arthur Lapham, his great-great-great grandfather, built the house in 1837, and although it is still standing out on Marseilles-Galion Road West, it’s in poor condition. The Lapham house is one of the oldest houses still standing in Marion County. This photo was taken in October of 2015. Unfortunately for all of you hoping to hear a good haunted house story, Mike more or less dismissed that idea. [T]he story is mostly myth. I know Reverend Marvin Crabtree’s daughter and grandson. She grew up in the house and assured me that the spot on the floor didn’t exist. Nor does she believe the house to be haunted. She did say that the wind made strange sounds around the roof eaves. As for the peddler myth, I have never seen any authenticating info. One story that I’ve heard over the years is that after President Harding’s wife, Florence Harding, died in Dr. Charles Sawyer’s house, her ghost began haunting the place. However, before getting to the haunted house part, let me start with a few facts about Florence Harding’s final years: After President Harding died on August 2, 1923, Mrs. Harding returned to Washington where she “bought a house and hoped to establish a social life.” However, as more and more scandals having to do with the Harding administration began to come to light and her health began to fail, Florence decided, at the urging of Dr. Sawyer, to return to Marion in July of 1924. 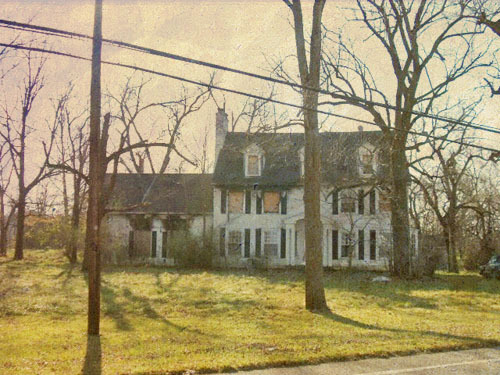 Once she was back in Marion, she took up residence at Dr. Sawyer’s White Oaks Farm, which included both the White Oaks Sanatorium as well as the Sawyer residence on Bellefontaine Avenue. (For the record, a sanatorium was not a facility for the insane but rather for people needing long term care, usually for tuberculosis.) After Dr. Sawyer himself died in September of 1924, Florence Harding “became increasingly withdrawn an ill” and died on November 21st, 1924 from kidney failure. On August 19, 2010, the former home of Dr. Sawyer, which was vacant at the time, was severely damaged in a fire. Whether Florence Harding actually died in the house on Bellefontaine is unclear. In an article appearing in the August 21, 2010, edition of The Marion Star, Sherry Hall, the education specialist for the Harding Home State Memorial is quoted as saying that Florence Harding did, in fact, die at the house. However, I also got in touch with a guy named Bill Watts. He was friends with Charles Sawyer’s grandson, Dr. Warren Sawyer, and told me, “It was only folklore that she died at the Sawyer house.” In fact, he went on to say that he’d always heard Mrs. Harding had died in one of the patient wards (or bungalows, as they were called) rather than the house on Bellefontaine. In an effort to sort out the location of her death once and for all, I actually got a copy of Mrs. Harding’s death certificate, which unhelpfully listed the location of her death as “White Oaks Farm”. So as I sit here, I have no idea if Mrs Harding actually died in the Bellefontaine Avenue house. The Sawyer House was located at 1201 Bellefontaine Avenue. After the house was nearly destroyed in a fire in 2010, it was demolished soon thereafter. This photo, courtesy of the Marion County auditor’s office, clearly shows the damage caused by the fire. I have been in that house hundreds of times, day and night, in the basement, living room, kitchen and all over the upstairs during those years. I personally have never seen a ghost nor have I ever heard Dr. Warren mention a ghost in the house. Like so many haunted house stories, this is one that has persisted as a word-of-mouth phenomena, and I can only imagine it has done so because it concerns such a well-known Marionite who died in a historically significant home. America’s First Ladies: A Historical Encyclopedia and Primary Document Collection of the Remarkable Women of the White House. By Nancy Hendricks. ABC-CLIO, 2015. p. 244. American First Ladies: Their Lives and Their Legacy. Edited by Lewis L. Gould. Routledge Press, 2001. p. 256. This last story centers on a rather mysterious postcard. In the course of researching other Spooky Marion stories, I’ve run across this card a few times. Presumably, it’s from around the turn of the century, since one of the cards I’ve seen was postmarked 1912. 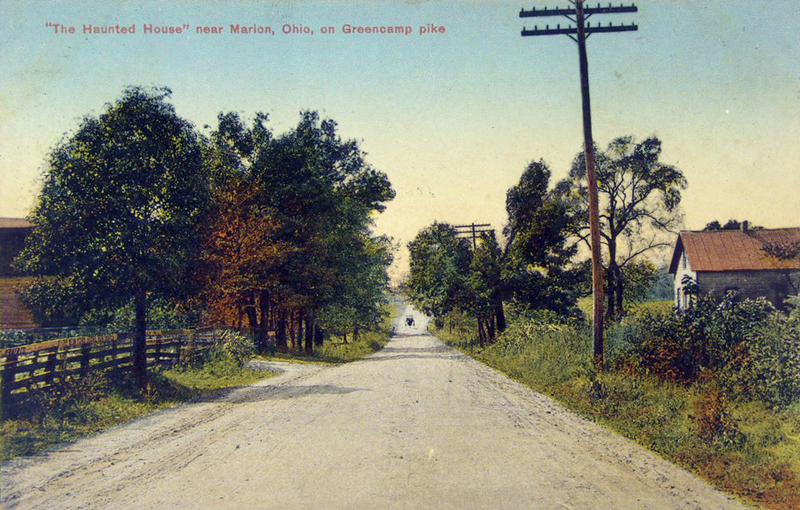 For a card that purports to show a picture of a haunted house, it’s actually a much better photo of the road (incorrectly written as “Greencamp Pike”) with part of a house visible on the right side. Green Camp Pike, incidentally, later became Bellefontaine Avenue. And for a long time that was all I had – a rather unremarkable postcard with a very tantalizing caption. The original postcard. Image courtesy of Shelby Clarkston-Needham. Back in 1908, when present State Route 739 from Marion to Green Camp was a dirt road, Grandpa drove his horse and buggy past “The Haunted House” a short distance from Marion on the Green Camp Pike. At any time of the year, it was said that the witches and goblins held their class reunion in this old “Haunted House”. [It] just may have been the place where the witch committee for Halloween [was] appointed. One final interesting piece of information about the postcard came from a “Growing up in Marion, Ohio” Facebook group member who said that the house had belonged to one of his ancestors, a guy named John James Jones Jr. (how’s that for alliteration?) who died in 1883. After Mr. Jones died, his wife moved out, and the house fell into disrepair. Eventually, stories began circulating that the house was haunted. Much as I would have liked a more dramatic story about the origin of this postcard, this simple explanation also seems the most likely. So there you have it. Three haunted house stories (kind of). If anyone out there has information to add about any of these places, feel free to drop me a line or comment below. I can assuredly tell you the house is not haunted. The house structure is a work of excellent carpenter craftsmanship. Long time owners the Crabtrees were extremely nice and caring people. They saved the house from ruins and lived there happily for several years. We purchased the house from them in 1979 and lived there until 1989 when we moved to Kansas. During that time we fully renovated the gorgeous Federal Colonial style home and built on to it. After that the home was sold at least two times. Then it fell into the hands of people who striped its regal appearance. The house was built from bricks made on the property in 1836! Captain Valentine Lapham, a Union soldier and son of the Lapham family who built the home, lived there before and after the war. 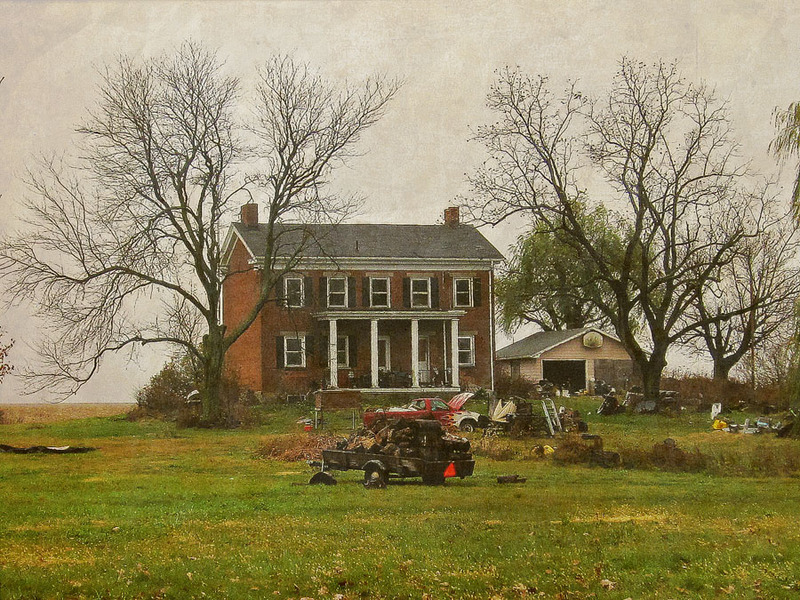 It is so unfortunate the home, once so beautiful, was left in disrepair as it is today. It makes our hearts so very sad. Hope someone takes action and buys it soon. Thanks for the additional input, Robert. The original builder, Arthur Lapham, was born in North Smithfield, Rhode Island in 1802. His entire extended family moved to Champaign County, Ohio in the early 1820’s, where he lived and married his wife before purchasing farm ground where the Lapham Brick now sits. Valentine (1842-1928), who you mentioned was their youngest child, was the only one who was born in that house. Arthur and his oldest son Amos set out for the California gold fields in the spring of 1849 with several other companions. Arthur and two others drowned in El Dorado County, California in 1850. His son Amos eventually returned to Ohio where he remained for some years before relocating with his family to Florida. Valentine returned to Marion after the war where he served as postmaster for a few years. Eventually, he and his family went to Chicago where he earned his living as a patent inventor. Arthur’s daughter, Cynthia, married my ggg grandfather, Emery Brewer. She was the only Lapham who remained in the Marion area. My mom, Betty Bailey Street worked at White Oaks answering service in the 1970s, and I was allowed to to work with her. Dr. Warren Sawyer and Mrs. Sawyer would get me and I would go to their house. When I was 12 or so, I got to touch President Harding’s flag that had been on his casket. The house or barn were not haunted. I loved going to visit the Sawyers. I watched Lawrence Welk with them met a Saudi prince. I also visited them when they moved from the house. They showed me all of the antiques in the house. Dr Sawyer got me my first job as a nurse’s aide at Community Nursing Center. I have been an LPN now for 27 years. I always wanted to be a nurse and with Dr. and Mrs. Sawyer’s help, I did it. Thanks for sharing your memories of the Sawyers, Sherry! My dad worked for Dr Sawyer in the 50s and 60s. Dr Sawyers house was haunted. The barn no. The little house that was by the orchard was haunted. There was something haunting the study in the main building. I loved that place. I learned to drive there. Dr Sawyer’s son taught me how to shoot. The Sawyer house was indeed haunted. I lived there with my family for almost 10 years and we had lights flicker on and off frequently. Going Ghost Hunting? Beware of Pareidolia! A Haunted House or Just a Rumor?